Looking for Samsung Soundbar Remote Codes? If you have a Samsung Sound Bar and want to control it with a universal remote control, SAT, or CABLE TV remote, we have the codes needed. A Samsung soundbar can be controlled with any universal remote or CABLE/SAT remote if you have the correct programming guide. You also need the correct remote codes for the sound bar which can be found below. If the codes below do not work with your Samsung sound bar, please leave a comment below with the model number of your remote control and the model number of your soundbar and we will find you the correct remote code. All remote codes above are reported working with the Samsung Soundbar Model Numbers: HW-FM55C, FM550, HE550, HW-HM45, F550, J450, HW-E450, HW-J450, HW-J650, HW-F450, WH-E450, HW-J355, HW-D450, HW-H550, HW-H7500/ZA, and HW-HM55C. These codes have been tested with the Comcast remote controls, Xfinity, DirecTV, DISH, COX, Verizon Fios, and many more. HINT: Use your Cable, SAT, or Universal remote control in “AUX MODE” to control your Samsung Soundbar. Note: If you have a Samsung TV, the Samsung Soundbar should automatically PAIR to the TV and the Samsung TV remote should control the sound for both the TV and Soundbar. It connects wirelessly on some models. Need more help programming your Universal or CAB SAT remote to your Samsung soundbar? Please leave your questions below and we will be happy to assist. Hello, I have a Samsung HW-M550 soundbar and would like to control it using a Champion URC2025B1 universal remote. Are you able to find the correct code? Having an issue getting Samsung model PS – WM20 sound barcodes to work with my GE universal remote. Remote only accepts 4 digit codes for the sound bar. I need help programming a Samsung HW-H550 Soundbar on a RC65 remote control. I have a DTV Receiver Model # HR44/700. I’ve tried all of the obvious things. I am trying to program my charter spectrum cable remote to my Samsung HW-H550 soundbar and I’m having no luck. Can’t get my samsung sound bar on my spectrum remote on aux. I have tried every code I can get my hands on and no luck! Trying to sync SAMSUNG SOUND BAR model # HW-J355 OR HW-J355/ZA to the DIRECT TV Genie remote RC73. Can’t find the code. Please help! Have the Samsung model HW-D450 and my remote from FIOS is model RC1445302/04B and no codes work. Your suggested codes are 5 digits and this remote only takes 4 digits. Hi my soundbar isn’t listed above. I have the HW-KM45/ZA. I have it running through my Xbox ONE and if I use voice commands I can turn the volume up and down and even mute it, but can’t control the volume with my Xbox tv remote. I can turn the channel on my cable box and every other function just not the volume. So I was looking for the “audio receiver remote code” the xbox says they are usually 4 numbers sometimes with a ketter in front. Spectrum remote 8780L or 8790L. I have a samsung hw-hm45c soundbar. Trying to connect it to a spectrum remote UR5U-8790L-TWC. Thank you! I need to setup my Samsung Soundbar (hwk360) with Atlas DVR 5 device Universal Remote I have ywo Samsung 55 Curved 4K TV’s on the first one I was able to use this and the soundbar was set to use Bluetooth, and was just controlled as the TV speakers, however, with the new on (same model) to will not work, it is choppy or won’t work at all. followed the suggestions on Samsung’s page to hold down the power to reboot and start the system back up without releasing it, to no avail. It does provide sound with it set as Digital instead of Bluetooth. but it cannot be controlled by TV remote and the variance with sound in programming to commercials is extremely low. Do you have any codes for Samsung sound bar HW-KM45c ?? I have a Samsung sound bar Model # HW-FM45C and Spectrum cable remote #UR5U-8780L-BHT. Have tried various codes but unable to pair. Can you help please with the correct code. Need codes for Samsung SoundBar HW-M360 and Charter Remote 1060BC3. I have Mitsubishi Universal remote control I need to program a 5 digit code to my samsung soundbar HWJM37 I tried the code listed for samsung soundbars on the website but none of them work on my remote control. Also I need codes Xfinity platform1 cable box. I’d like to give back a little and provide a fix for linking up our Samsung audio soundbar and subwoofer – model HW-K360/ZA – to the directv remote. Our TV is a Samsung series H4500 TV, 28″ screen. I don’t know if this solution will work with other TVs like Vizio and LG, apart from a Samsung TV. My guess though is that it should work. First, you have your Direct TV remote programmed so it controls your TV. Second, hook up the Samsung soundbar to the TV with a Digital Toslink cable (not the hdmi connector nor analogue rca cables). Third, using the soundbar remote, turn the soundbar on. Now the Directv remote should control the volume on the soundbar. Hey, this worked on my Spectrum universal remote as well, you saved my sanity thank you! Thanks, Dave, your setup worked fine for me. I had given up on this until I read your reply. I am looking for codes for a Samsung HW-F355 for a Charter 1063 remote. please help. need program code any help??? Looking for a 4 digit code for a Samsung sound bar model HW-F355 to pair up with a new Spectrum remote. Thanks! I have tried all the above codes. I have a Samsung HW-KM45C Soundbar and a Directv RC66X remote. I tried your codes but they didn’t work. Any ideas? Hey. Tried entering the codes provided for my new Samsung sound bar (HW-KM45C) To my Charter remote (1060BC2) but they are not working. Any suggestions? Can I use my Samsung Galaxy S 5 phone’s IR to do it…Or Panasonic N2QAYB000570 for plasma TV remote, or Directv remote RC23… .PS4 PS3 consolesjs it possible to link sub to phone..BLUETOOTH? I’m trying to program my Sharp Aquos tv remote with my Samsung HW-J370 soundbar. Anybody know the right code? I have a samsung sound bar model hw-h450 need 4 digit code for a GE universal remote model 33709, tried the codes described in the manual to no avail. I have a Samsung HW -F350 soundbar, and trying to use my Shaw Direct Satellite remote Arris URC 600 in AUX mode. I have searched the net and tried many many codes and also contacted my satellite provider (Shaw Direct) who gave me more codes to try. I’m trying to get a Samsung Soundbar, HW-K360 to work with a TIVO “Peanut” remote. If it matters this is the Glo remote. Need 4-digit code (not 5) for Samsung sound bar HW-K550 to work with Spectrum RC122 remote. HW-E450 Samsung sound bar with charter-urc1060 remote. None of the codes seem to work online or in the remote manual. I could not get the codes above to work. I have a Samsung hw-k550 soundbar and a charter spectrum remote. I have a Samsung HT-X810 soundbar, but i can not find a code that works using my Chunghop L809 – universal remote. I need a 4 digit code. I set the remote to AUX mode when typing codes. RM-VZ320, I tried the five codes with the button SAT/CBL, and it doesn’t work. Can you give the code? I have a Samsung HW-J355 and I need a 4 didgit code for my cogeco universal remote. Please help! I have a Samsung HW- E450 – trying to use a Verizon Fios – rc1445302 / 03b remote – 4 devices – uses only 4 digit codes not 5, please help! What about the K450 K series code ? I have a GE universal remote that requires a 4 digit code to work with my Samsung HW H450 soundbar. I have an HW-j355 and trying to connect using a panasonic eur7627z90. I’m trying to link my new soundbar to my DirecTV remote. I’ve tried over 65 codes, no success…. 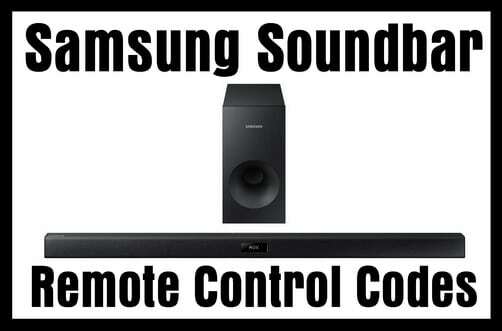 For a RC65 DirecTV remote to control a Samsung Soundbar use the remote code 10812. If that does not work, try using remote code 12051. Need a code for a Samsung hw-k450 sound bar. I am looking for the 5 digit code for my Samsung HW-J250 soundbar. I have a Charter Spectrum remote (model 1060BC2 / 1060BC3). Please help! Thanks!!! Im looking too. The tv I have (also samsung) does not auto pair. This is a pain! Need remote code for Samsung hw-j355 soundbar to dish tv 20.1 remote. I am looking for a code for HW-HM45 that is compatible with Charter Spectrum 1060BC2/1060BC3. Let me know if you find anything. Please help with a 4 digit code to pair GE universal remote to Samsung HW-H450 soundbar! I need the codes to program a Samsung HW-K550 Soundbar to a Comcast remote XR2. I have a Universal Electronics C4000 remote through Charter. I’m trying to program a Samsung HW-KM45C sound bar and my remote recognizes the 20045 code but the volume control on the remote still does not operate. This is very frustrating and I hope I can find an answer. Do you have universal code for Samsung KW450 soundbar? I am using FIBE remote (Bell) Toronto, Canada. I need to know the remote codes for Samsung sound bar model number hwh450 using dish remote 40.0 uhf 2g. Did you ever find a code that works with your Spectrum remote? I have tried every number I could find… Remote takes 4 digits. I have a HW FM55C Samsung soundbar. Using a Dish Remote 20.0 IR. Attempting to set up remote using ‘aux’ button and codes provided on this web page. Dish appears to only use 3 digit codes not the 5 digit provided. I have Samsung sound system SPS-3510 (very old) and my remote controller is missing and not available in the market..
GE universal remote 24922 or UR5U-8780l-twm for Time Warner remote. Samsung k450 k series sound bar. Would be great to find a working code and/or remote that will work! I have a 4 device Fios Philips remote. Trying to pair a HW-K55 Samsung Soundbar. Thanks! Samsung soundbar HW-H450 with GE universal remote 33711 CL3. I have an he-k360 Samsung sound bar. -Turn on the Samsung sound bar you are programming. -Press and hold the “Setup” button until the status LED at the top of the remote changes from red to green. -Type in the Samsung Sound Bar code 31868, or… 31950, 32660, 31949, 32137, 31304. -If the code is entered correctly, the status LED will flash green twice. If the status LED blinks red, then green the code was not entered correctly.